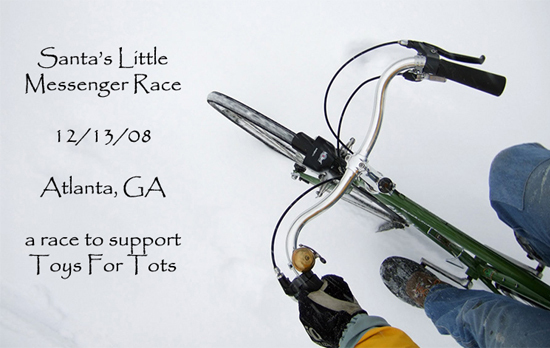 This year, like last, I decided to hold the Santa’s Little Messenger Bicycle Race benefiting Atlanta’s Toys For Tots program. The concept behind the race is that individuals and businesses around town, who were going to donate a toy to Toys For Tots, register the toy with me via a web form instead of finding a local drop off point. Then, on the day of the race, riders picked up the toys and returned them to the “base”. Two categories of racers (solo and two-person teams) competed to earn the most “toy miles”. The race began almost immediately with a terrible rain storm but all the riders really toughed it out and did a great job. This year, seventeen racers (six teams and five solo racers) collected 96 toys. The complete results are available on Faster Mustache.org.